Dallas, TX. As we say, American by birth, Texan by the grace of God. I graduated from college in 2008, right when the recession was starting. I was an art history major, but cast a wide net in my job search since there wasn’t much available, and pursued opportunities in marketing as well as the art world. SHIFT hired me as an intern and then as an AC about a month and a half later. I’m so grateful to have had the opportunity to start my career at a company where I’ve learned so much and worked with fantastic people. Ridiculously enough, when you Google “Alexandra Brooks,” the first search result is the website of a psychic who shares my name. Apparently, she is a Healer who works with Pink Light, a gentle healing light that resonates to the energies of love, harmony, and peace (verbiage taken from her website – I can’t make that stuff up). As I tend to embrace an “insert sarcasm here” credo, this coincidence is pretty epic. My ideal cocktail already exists – the French 75 (champagne, gin, lemon juice, and sugar). What can I say? I love my bubbles. Also love the classic cocktail nostalgia; I can see Coco Chanel knocking these back in Paris. While it may have initially been an online spot for food lovers and wedding hopefuls, the site has become much more as a number of brands, businesses, and influencers have joined the Pin-sanity. The site was recently named one of the top 10 websites within the Hitwise Social Networks with nearly 11 million total visits in a week. And according to a study by Shareaholic, Pinterest drives more referral traffic than Google Plus, YouTube and LinkedIn combined. Just a few months ago, I was that person who didn’t get it. Why was this virtual pin board so cool? After taking another poke around the site, I quickly became a Pin-somniac. What’s not to love about bookmarking and organizing you favorite photos and feeling creative? Being able to click through images to other interesting links made the site even more addicting and exciting, which brings to me to why others are catching on to the social media network trend. As brands have become comfortable with Facebook and Twitter and are learning the ins and outs of Google+, they are now adding Pinterest to their social media repertoire. The ability to pin and share photos through links helps drive traffic and therefore, increase visibility and sales. A marketer’s dream, right? Chobani and Mashable are just a few examples of some who are successfully pinning their own product/content. Marketers are even thinking outside the box, using Pinterest for contests, adding a Pin-It buttons to their site and using hashtags. Brands are not only using the site to promote their own product, but create a brand personality online that will engage users. 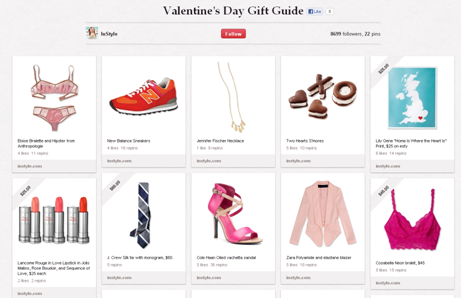 Take for example, InStyle Magazine created a board for a Valentine’s Day Gift Guide, in which its 4,000+ followers most likely re-pinned, liked and purchased these products. Just like Twitter and Facebook, people follow personal brands and enjoy seeing what their favorite guru’s inspiration. 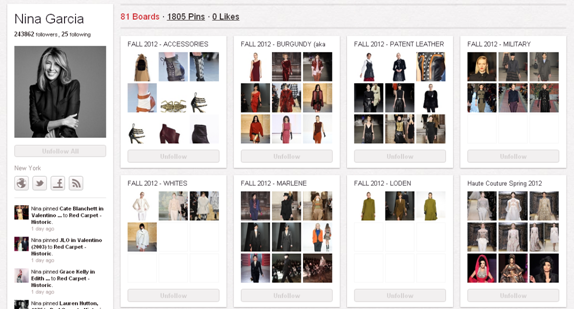 Fashion Director for Marie Claire, Nina Garcia, an expert in the fashion trend, for example, is very active in the Pin world with more than 240,000 followers interested in the upcoming seasonal fashion. Whether you’re using the social network to spark ideas for your clients or for your own personal enjoyment, Pinterest is a fun and easy-to-use social tool that I believe has the power to stick around for a while. Although the site’s user base is mostly female, I have a feeling the guys won’t be too far behind to catch onto the trend. Are you convinced of the pin-sation? 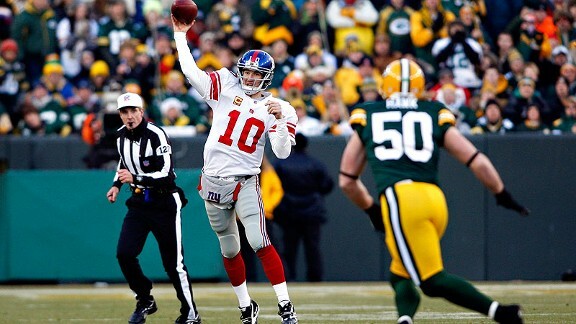 After four straight convincing wins, the New York Giants are in the NFC Championship Game. And of the four teams still alive in the NFL playoffs, they have the best chance to win Super Bowl XLVI. It’s easy to forget that on December 18, they were 7-7 and had just gotten embarrassed at home by the last place Washington Redskins. Statistically, the Giants were near the bottom of the league in total defense and were last in the NFL in rushing. With two games left on the schedule, their postseason hopes were on life support. Yet in only a month’s time, the Giants have not only turned into the sport’s hottest team, but they have become the most balanced team in the league. Led by Pro Bowl quarterback Eli Manning and receivers Victor Cruz and Hakeem Nicks, the aerial attack is still as dangerous as it’s been all year, but the late-season emergence of a disciplined defense with the NFL’s best pass rush and an effective running game has been the difference between missing the playoffs and contending for a championship. On offense, the Giants are simply difficult to defend. When they come out in three-receiver sets with Cruz, Nicks, and Mario Manningham, they can throw the ball down the field or keep it on the ground with Ahmad Bradshaw or Brandon Jacobs, which opens up play action. In theory, the Giants can execute a full gameplan using one formation, making it tough for defenders to know what’s coming. Flip to the other side of the ball, and the Giants can do what most teams in the NFL can’t – they get to the quarterback with only a four-man rush. At times, they can get pressure with Jason Pierre-Paul, Justin Tuck, Osi Umenyiora and Mathias Kiwanuka and don’t have to send linebackers and defensive backs on blitzes. That means opposing quarterbacks have only a few seconds to throw the ball – into full coverage – before the pass rush gets there. Green Bay’s Aaron Rodgers, the probable MVP, can tell you that’s hard to do. The Giants have peaked at the right time, are versatile enough to win any type of football game, and have an elite quarterback in Manning, who set an NFL record this season with 15 fourth-quarter touchdown passes. Sorry San Francisco and Boston (and SHIFT-less Baltimore), but it’s the Giants’ Super Bowl title to lose. What made you enter the PR industry? When I was entering college, a friend who had already graduated got her first job doing in-house PR. I loved how her days always sounded busy and different and was intrigued from that moment on. Didn’t hurt that my alma mater, University of Florida, had one hell of a communications program! When you Google yourself, what’s the first thing that pops up? A Facebook page for someone that may share my name but does not bear any resemblance to me in the slightest. What blogs or Web sites do you ready everyday? For the sensible adult part of me – CNN.com, big dailies like the NYTimes; for the geek in me – CNET and some other riveting tech pubs; the domestic part of me LOVES picky-palate.com; and the part of me that needs mindless entertainment frequents Perez Hilton of course. If there was a cocktail created just for you, what would you name it? The Velvet Hammer – I have been told on more than one occasion that I can lay the smack down in an oh-so-pleasant way. 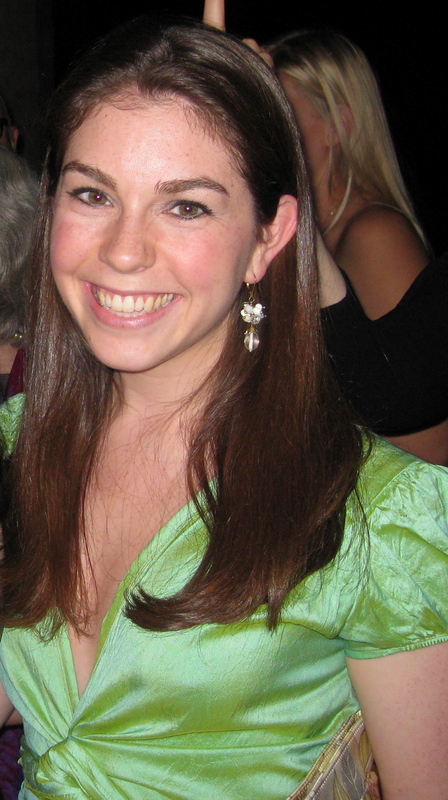 Tell us something unexpected/surprising about you: I have quite the “extensive” dancing career from being that peppy (read: annoying) girl dancing at Bar/Bat Mitzvahs to a short stint on TV circa 1995. What do you feel is your greatest personal success in PR thus far? : I would have to say rather than one “shining moment,” I think it’s been my ability to develop a strong rapport with my clients. It’s so important and mutually beneficial. Every client is different but I always make it a point to get to know their “soft spot” whether it’s their kids, their love of gourmet food, or their favorite football team. When you can find something you have in common and make it a part of the conversation, you are able to form a bond that makes working together much nicer.